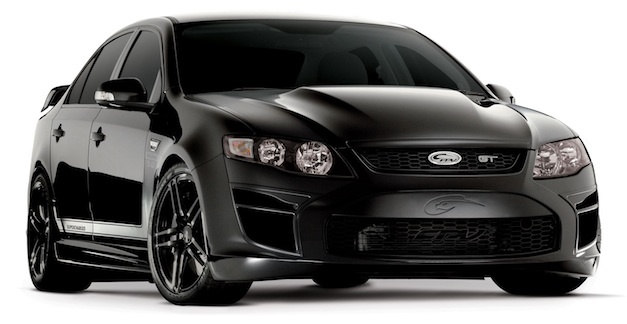 FPV is the “SVT” of Ford Australia… but without the ongoing quality and engineering issues. FPV has done a great job building special edition Falcons that focus not only on power but also on handling dynamics. The GT Black is their latest iteration. Its low-pressure supercharged FPV engine makes 449 HP and 420 lb ft of torque. The engine itself is the same 5 liter V-8 used in the Mustang GT, weak connecting rods and all. Which probably explains the minimal power gains. The FPV Falcon is a halo car for Ford of Australia, a means of trying to raise sales. Falcon sales have dropped considerably in recent years, the market is moving away from cars of this size and fuel economy. GM – aka Holden, is experiencing the same sales issues with their similarly sized rear wheel drive models (known as the Pontiac G8 when it was for sale in North America). The Aussies at Holden and Ford have stubbornly – and heroically – clung to this type of product against the shift of the market. We have to admire the Australians for their work here, but from a financial standpoint it may be hopeless in the long run and time is running out in direct proportion to the drop in sales. Looking to the future, the sales drop lengthens the odds against any idea of designing a worldwide rear wheel drive platform to share across the Mustang and Falcon lines (and perhaps Lincoln). Not because of the financial advantages of platform sharing, but because the market for a Falcon of the current size and fuel economy is evaporating. Given the drop in sales, Ford has all but announced that a variant of a future Ford Taurus would be the basis for the next-generation Falcon (this idea has been tried once before with disastrous results) and a decision is due this summer. The door isn’t closed yet, but it is rapidly closing. So let’s enjoy the Falcon while we can, even if from afar. FPV has today announced the launch of its most limited edition vehicle to date, the GT BLACK. Responding to the overwhelming feedback received on the FPV Concept, revealed at this year’s Australian International Motor Show, FPV have taken the popular black-on-black treatment and applied the stealth-looking paintwork to just 125 units of the current standard supercharged Boss 335kW GT, creating the FPV GT BLACK. “We were totally blown away by the positive feedback received from fans and show-goers on our Concept,” FPV General Manager Rod Barrett said. With all black finished styling, black alloy wheels, black tail pipes and all-new matt black striping decals the GT BLACK will display a striking presence on our roads. The limited edition GT BLACK is powered by the much vaunted all-aluminium BOSS 335 5.0-litre supercharged engine with a maximum power output of 335kW at 5750rpm, combined with maximum torque of 570Nm delivered across a broad 2200-5500 rpm range. The newest addition to the FPV stable will be finished in menacing Silhouette black paintwork and will carry the excellent features of the current GT range plus some exciting extras, including reverse camera and leather seating. An all-new styling matt black stripe decal will feature on the bonnet, rear wing and bodysides, with the black paint treatment also carrying over on to the front and rear bumpers and upper and lower grilles. The fog lamp bezels have also been made black, as have the exhaust tips, while completing the exterior will be GT premium five-spoke 19-inch alloy wheels finished in gloss black with black wheel nuts. Inside the all black theme continues with black leather trim throughout, a black finish around the Interior Command Centre (ICC) unit, tissue box and door spears, and a unique black gear shift badge on manual transmission models. Further enhancing the collectability of the GT BLACK, each vehicle will come with its own unique build badge and certificate of authenticity. The recommended Manufacturer’s List Price for the GT BLACK is $74,290, at participating FPV Dealers only.